Home » end of year » Friday Google Tidbit » Google Classroom » Friday G Suite Update: End of Year Tips for Classroom! 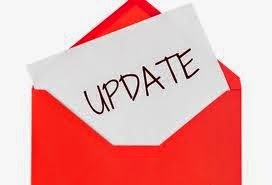 Friday G Suite Update: End of Year Tips for Classroom! This week, we are sharing strategies for wrapping up your Google Classroom for the year. Google Classroom creates a "Classroom" folder in your Google Drive. In the folder is a sub-folder for each class you have created. You can move the folders and I recommend making a new favorites folder and moving any favorite assignments or project examples to this folder. It will make it easy to add assignments or handouts next year to your new classes. Another good idea is to create a 2016-2017 sub-folder in your "Classroom" folder and move all your current courses into the folder. This will make it clean and ready to go for next year. Google has an archive tool to save your completed classes and remove them from your home screen. Note that you cannot add new assignments and students can no longer turn in assignments once a class is archived. 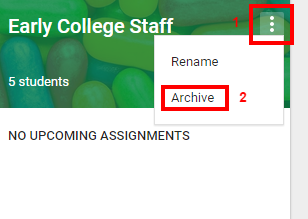 To archive a class, login to Google Classroom and click on the three dots next to the class you wish to archive. To see a list of your archived classes, click on the button and scroll to the bottom, then click on "archived classes". It is not too early to go ahead and create your new classes for next year. I recommend creating new classes each semester or year, depending on how often you get new students. Google Classroom has the ability to save assignments and announcements as drafts and reuse assignments, you can use this time to pre-populate your classes as well as add your syllabus and resource documents. Don't forget that you can now schedule posts to appear for your students on the first day of 2017-2018!